I am working on an article about flexfields and flexfield validation. Even though the article is not yet finished, I thought the part about ‘SPECIAL’ and ‘PAIR’ validation types might be interesting enough. Many people seem to think they can only use the seeded validation sets. However, you can also create your own validation sets. And their options are very powerful. So I wanted to publish this part of the article as a prelude to the full story. Special validation is used to provide flexfield functionality for a single value. What that means is that you can have for example a concurrent program parameter that will be filled with a Key flexfield value, or a range of flexfield values. Let’s go back to the Key Flexfield. We know that they are combinations of different segment values that are stored in a separate combination table. 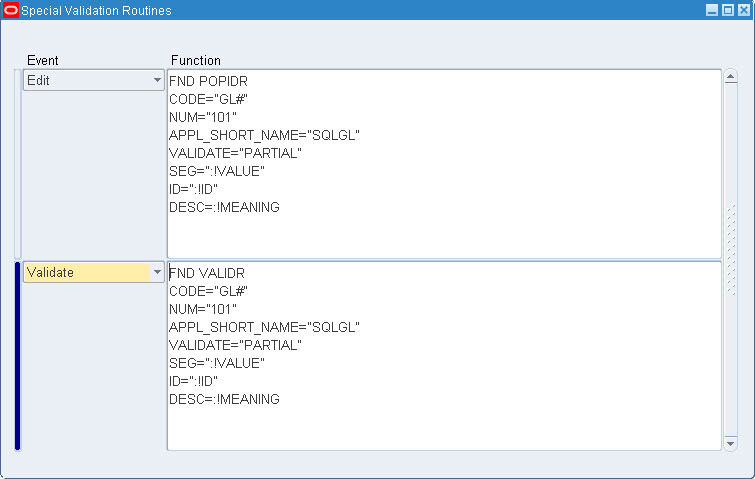 When you want to submit a key-flexfield combination as a parameter to a concurrent program, you can code your own validation for the separate values. But you’ll be missing the nice functionality that gives you pop-ups, a validation over the resulting combination and if needed the ID-value for the flexfield combination. That is possible with a ‘Special’ validation type. 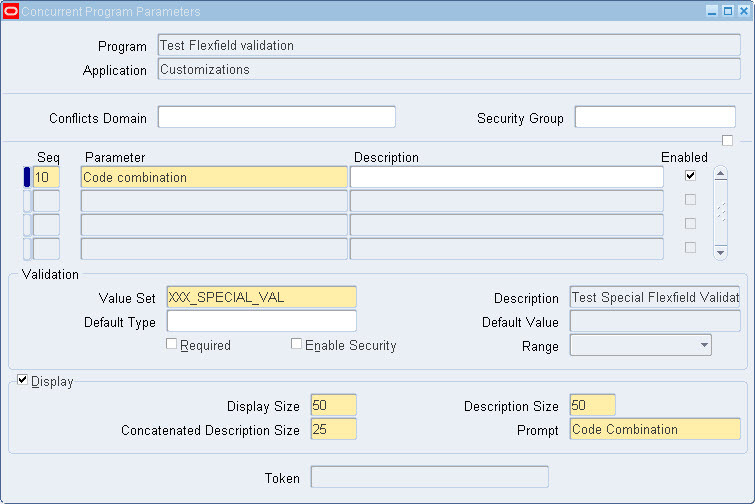 The special validation uses a number of user exits to enter, validate and query keyflex segments. With special validation, you will be able to enter one or more segment values for a key flexfield. To enter these segment values, 3 user exits can be used. They are: ‘POPID’, ‘VALID’ and ‘LOADID’. 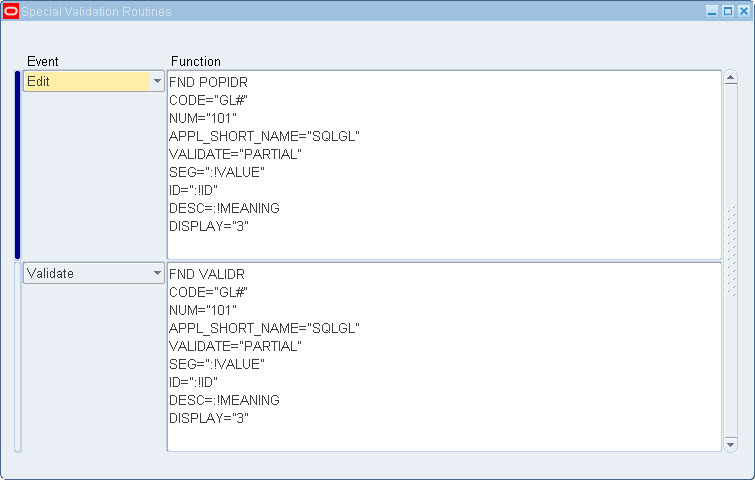 POPID is used to enable the user to enter the flexfield segment value. It is called when the users cursor enters the segment value field. With this user exit, you decide which segment values should be shown, and how they should be shown. 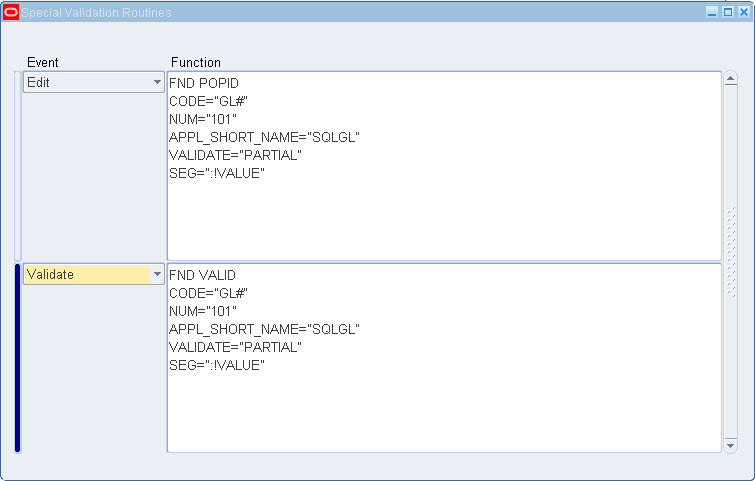 VALID is called when the user exits the segment value, or confirms the chosen flexfield combination. It validates the entered value against the values existing in the key flexfield table. LOADID is optional, and it can be used to choose which information will be returned as flexfield value. This can be the concatenated segments, or the id-value for the flexfield combination or segment values. These 3 user exits can be assigned to 3 ‘events’. There are more events possible, but they are either not yet in use, or their use is not yet supported. So we will only use ‘Validate’, ‘Edit’ and ‘Load’. Sounds complicated, so far? Don’t worry; this is not an easy validation. But we’ll build some examples to give you an idea. First we start with building a very easy special validation. This will be built on our Code Combination key flexfield. We’ll be using a concurrent program ‘Test Flex Validation’ program to see our different options. This will only write the parameter value to the output of the request. To use flexfields as parameters for concurrent programs, we need to define a value set based on them. We will start with the barest setup to enter a key-flexfield combination. 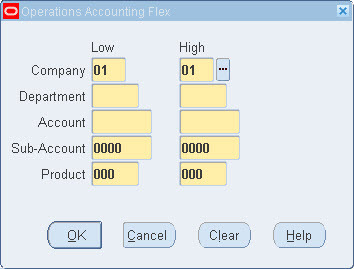 For this article, we use the accounting flexfield, with code ‘GL#’ and id-num ‘101’. The first box is for the edit event. This will be triggered when the user enters the cursor into the field with this value set. FND POPID This is the user exit to pop up a flexfield screen, and let the user enter the flexfield values. CODE="GL#" This is the flexfield code for the key flexfield that we will be using. APPL_SHORT_NAME="SQLGL" The short name for the application the flexfield belongs too. Together with ‘Code’, this will identify the flexfield itself. NUM="101" The id-number for the flexfield structure. If you have only a single structure flexfield, it is optional. For flexfields enabled for multiple structures, you need to enter the id-number. VALIDATE="PARTIAL" Validate can be ‘None’, ‘Partial’ or ‘Full’. None means the combination is not validated. Partial means that the separate segments are validated, there is no validation if the combination exists. Full means that segments and combination will be checked, and if a new value is entered, this will be inserted into the key flexfield table. 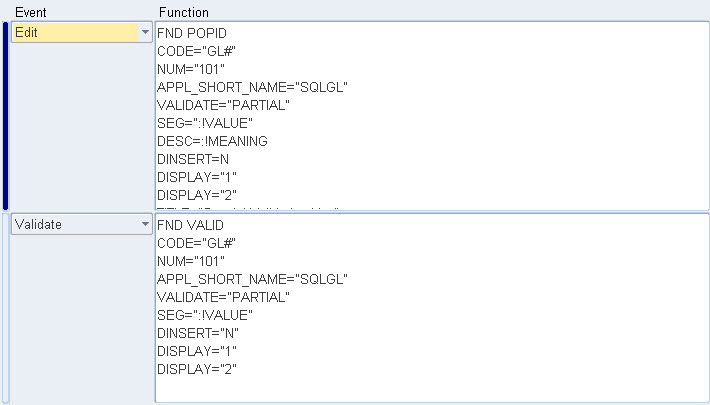 SEG=":!VALUE" This is the forms field that will be used to store the value of the segments. The second box is for the ‘Validation’ event. This code will be called when the user navigates out of the field, or submits the entire combination. We have all the functionality of the key flexfield. 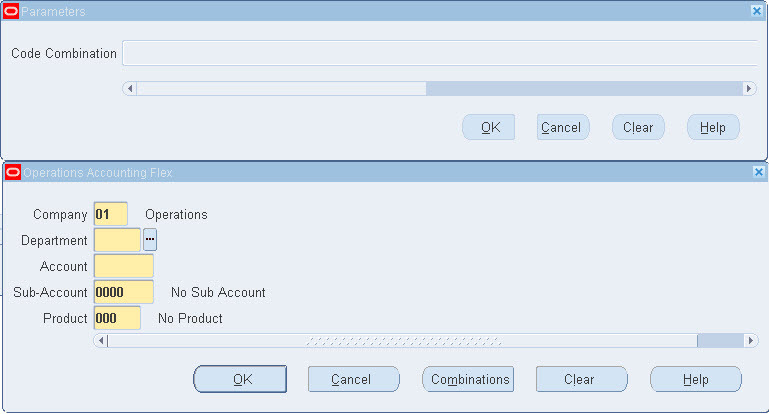 We can use the ‘Combinations’ button to search for existing combinations, and all separate segments will be validated, as will be the final combination. Now let’s see some more features of this validation. For example, we’d like to have the value of the combination id. (CODE_COMBINATION_ID in our case, since we use the Accounting Flexfield). The ‘Load’ event will get the combination-id from the flexfield table. This is only possible for the ‘VALIDATE=”FULL”, since it will validate the whole combination. Also we need to set the ID=”:!ID”. This will populate the :!ID column with the ID value of the combination. Finally, I added the ‘DINSERT=”NO” ‘, because we don’t want to allow insertion of new code combinations from this value set. (And Validation=”FULL” by default inserts new combinations into the flexfield column). 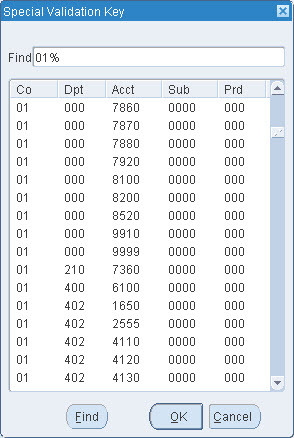 With these user exits it is also possible to select just a number of segments, instead of the whole combination. For this we remove the ‘Load’ / ‘LOADID’ part again. WHERE="segment2 not like '1%' "
There is no Dpt starting with 1. 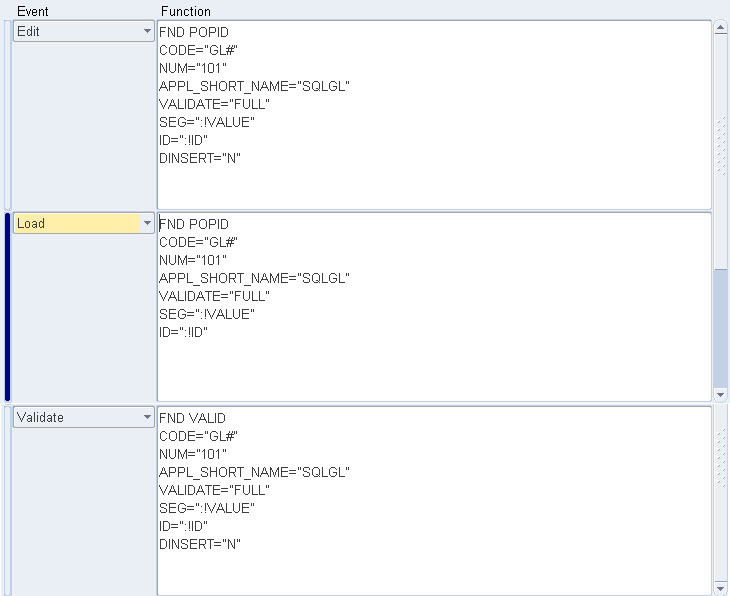 This PL/SQL procedure validates a (Dutch) bank account number. If it does need pass the test, a message will be displayed. This gives you almost unlimited possibilities for validating entered data. As you can see, it is only a ‘Validate’ event. Because we don’t need any special functionality for entering the data. We can limit the entry to numbers only on the ‘Validation Set’ main page. Please try the different options for yourself, and realize the possibilities of the special validation. Meanwhile, we’ll continue to the ‘Pair’ validation. The pair validation is very much like the ‘special’ validation. It uses the same kind of user exits, but this time, a range of segment values or combinations is selected. Let’s first create a range of the account segment. Instead of using POPID and VALID, we use POPIDR and VALIDR. The R-version of the user-exits automatically create a range. Of course we need 2 parameters to set the range. However, we need only one validation set. The next step is to set the parameters for both the low and high value. Both parameters have the validation set ‘XXX_PAIR_VAL’. Now when we run the program, we can enter a range. This includes validation that the high value is indeed higher or equal to the low value. Of course the concurrent program will receive the values for 2 parameters. When we use the full validation we can enter a range of the whole account combination. Note that we cannot use the FULL validation for pair-validation. Because that would mean the use of the combination-id from the flexfield table and based on the combination-id’s you cannot build a range. So we can only use PARTIAL and NONE for the validation. For that same reason, I have not yet had a reason to use a LOAD event for PAIR validation. It is however allowed to use one. That completes the chapter on PAIR validation too. 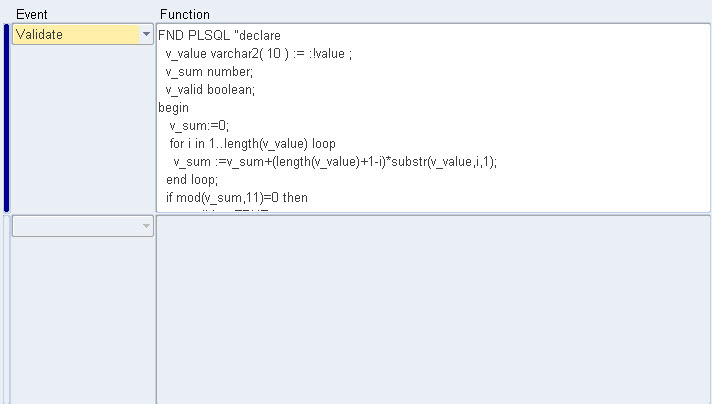 This entry was posted in eBS, Flexfields, Internals, Oracle, Tutorials, Validation and tagged eBS, Flexfields, loadid, loadidr, Oracle, pair validation, popid, popidr, special validation, valid, Validation, validation type, validr on April 25, 2010 by Arian Stijf.